Not to be confused with Autograph. Autograph! is a minigame in WarioWare Gold in the game's Toy Room. In it, the player is prompted to make their signature using the stylus. 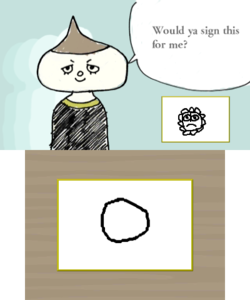 Signatures that are too simple or too large are rejected and the player will be prompted to redo it. They are then tasked to replicate their signature as much as possible when signing anything fans may give the player. Once several fans have come up to the player, a "That's all, folks!" prompt appears, and the player is given a "fan satisfaction" score; the higher the score, the more the fans are pleased. This page was last edited on April 18, 2019, at 22:15.